With unexpected vampires appearing and expected vampires disappearing, everyone seems to believe Alexia responsible. Can she figure out what is actually happening to London's high society?Will her soulless ability to negate supernatural powers prove useful or just plain embarrassing? Finally, who is the real enemy, and do they have treacle tart? I've read her Parasol Protectorate series before, but I wanted to revisit it having just finished the tetralogy and before moving into The Custard Protocol. 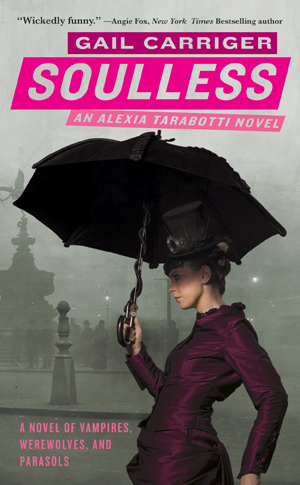 Soulless is set twenty years after Sophronia attends Mademoiselle Geraldine's Finishing Academy for Young Ladies of Quality. 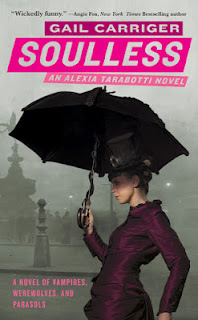 Alexia Tarabotti is considered a spinster at the ripe old age of twenty-six. She is tall, shapely, and of Italian heritage - which her mother believes is all working against her in the quest to find a husband. The truth is that Alexia is is intelligent, stubborn, and in search for adventure. She isn't willing to sit idly by when strange things are afoot. And being the only preternatural in Great Britain, her born "talents" put her in a serious advantage. Alexia doesn't have a soul, and when she comes into contact with supernatural (vampire, werewolf, etc), she neutralizes their abilities. Emily Grey does a fantastic job narrating the first int his fun series.While I enjoyed Moira Quirk immensely and was a little disappointed to find out that she didn't narrate the earlier titles, I quickly came to appreciate Grey's special touch. Carriger does an excellent job of creating strong female characters who avoid becoming the damsel in distress. Sure the Earl Maccon steps in and saves Alexia in the end, but it's not before she has saved him a half a dozen times to start with. The female characters are smart, driven, and unafraid to make unpopular decisions when it comes to protecting Queen and country. And then there's the steampunk elements. I wish I had the nerve to get really into steampunk. I love the costumes, gadgets, and jewelry that fans adorn themselves in for conventions. While the corset reveals a little too much cleavage for my liking, the costumes are pretty spectacular. There's Queen Victoria, of course, and automatons, and wicked parasols that hide weapons that make any refined lady a formidable foe. There's just something about the refinement and danger that makes me happy. And the stories are just fun. So if you like the paranormal...if you like strong female characters and bit of adventure...then make some time for Gail Carrier's Soulless. I think you'll be glad you did.